New Age Metals 2017 Drill Program Update at the River Valley Platinum Group Metal Project, Sudbury Mining District, Ontario. – New Age Metals Inc.
River Valley is the Largest Undeveloped Primary PGM resource in Canada, with 2.5 Moz PGM, in Measured Plus Indicated mineral resources and near-surface mineralization covering over 16kms of strike. August 17th, 2017 Vancouver, Canada – New Age Metals Inc. (TSXV: NAM; OTCQB: PAWEF; FSE: P7J.F) is pleased to announce that the 2017 Drill Program is at the midway point in the planned program on the Dana North (T3) and Pine Zone at the River Valley PGM Project, approximately 100 kilometers east of Sudbury, Ontario. The Induced Polarization (IP) geophysical survey and borehole geophysics was completed by Abitibi Geophysics and a final report has been completed. The first portion of the drill program was concentrated on follow-up drill testing of the 2015-2016 PGM mineralization at the Pine Zone. Drilling will now focus on the geophysical interpretation from the recently completed IP Survey. 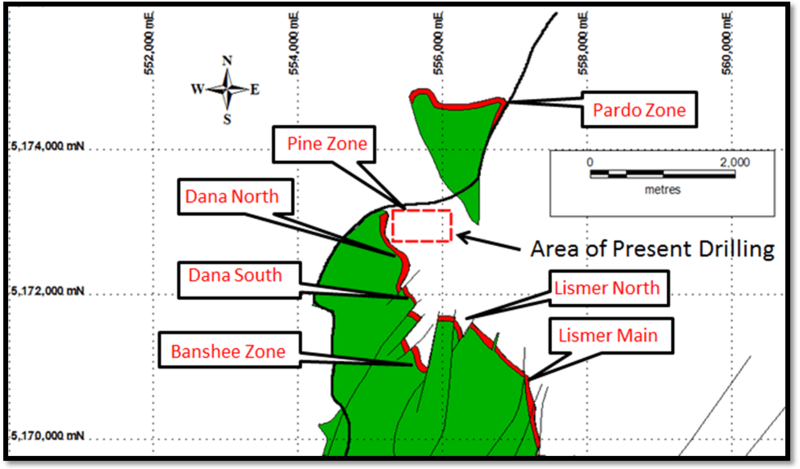 The Pine Zone is one of numerous prospective PGM zones (Figure 2) within the district-scale River Valley PGM Project and was recently drilled in the fall of 2016 (press release December 13, 2016). The 2016 drill program confirmed the higher-grade, near-surface PGM discovery made in the 2015 drill program (press release March 11, 2015), and highlighted the continuity of the mineralization for 200 metres along strike and 100-200 metres depth at the Pine Zone. The Pine Zone remains open along strike and at depth. The recent drill program (Figure 1) has completed 6 follow-up holes on this zone. Approximately 5000 meters (16,500 feet) of drilling is planned for the present drill program. The first batch of assays has been sent to the laboratory and results are expected in the next few weeks. The second batch of assays is scheduled to be sent to the laboratory after the next drill hole. The surface IP geophysical survey was designed to test the eastward and southward extension and dip/plunge of the Pine Zone, as well as the adjacent Dana North Zone (Figure 1). The extension of the IP survey tested the Banshee Zone. Initial interpretations are complete and the final report has been completed. Several new targets from the geophysics have been identified and are planned for drill testing. This present exploration activity of drilling and geophysics is geared to establish the resource base for a Preliminary Economic Assessment (PEA) Report which the company plans to complete before the end of 2018. To date (not including the present drill program) approximately 671 holes (152,394 metres) have been conducted by the company and its past major joint venture partners to test the PGM mineralization extents of the River Valley Intrusion. As well, several 43-101 complaint resource estimates have been generated. The River Valley Deposit is the Largest Undeveloped Primary PGM resource in Canada, with 2.5M oz PGM, in Measured Plus Indicated mineral resources and near-surface mineralization covering over 16kms of continuous strike length and open at depth. Figure 2. Property scale geological map showing the location of the Pine Zone discovery relative to the Dana North Zone immediately to the west, and the Pardo Zone 2 km to the northeast. Note the apparent dextral sense of offset of the River Valley PGM deposit (red) across the Grenville Front Tectonic Zone. Figure 3. 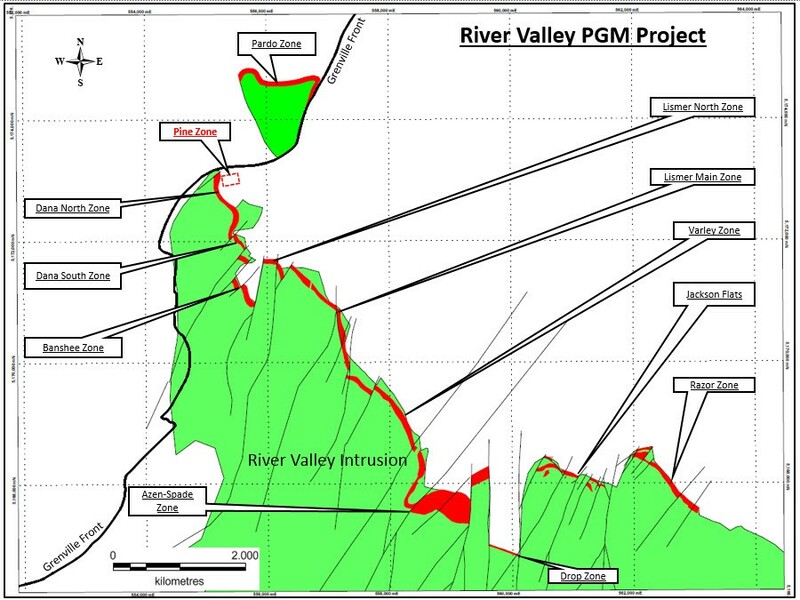 Location of NAM’s 100% owned River Valley PGM Project. 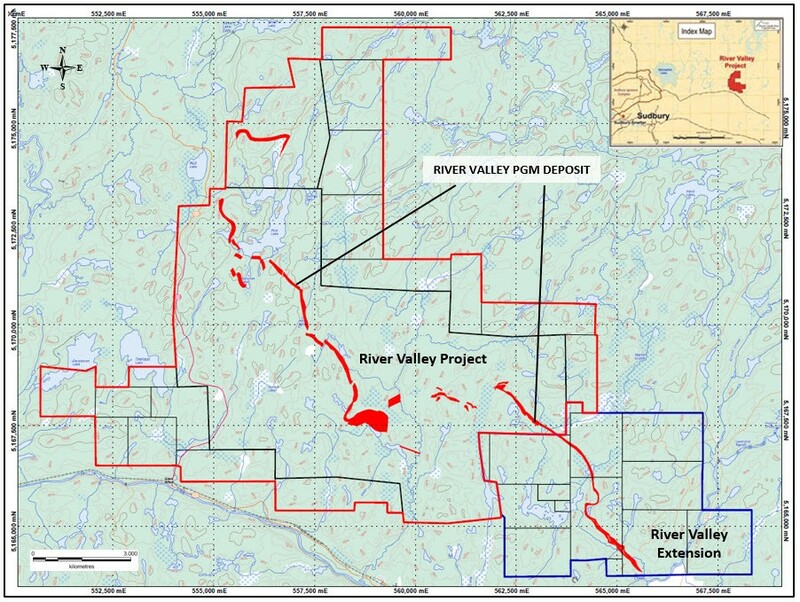 NAM’s flagship project is its 100% owned River Valley PGM Project (NAM Website – River Valley Project) in the Sudbury Mining District of Northern Ontario (100 km east of Sudbury, Ontario). Presently the River Valley Project is Canada’s largest primary undeveloped PGM deposit with Measured + Indicated resources of 91 million tonnes @ 0.58 g/t* Palladium, 0.22 g/t Platinum, 0.04 g/t Gold, at a cut-off grade of 0.8 g/t for a PdEq of 2,463,000 ounces PGM plus Gold. The River Valley PGM-Copper-Nickel Sulphide mineralized zones remain open to expansion, and geophysics currently completed and drilling to commence mid July 2017 as part of our ongoing continued exploration. The Company has five pegmatite hosted Lithium Projects in the Winnipeg River Pegmatite Field, located in SE Manitoba. This Pegmatite Field hosts the world class Tanco Pegmatite that has been mined for Tantalum, Cesium and Spodumene (one of the primary Lithium ore minerals) in varying capacities, since 1969. NAM’s Lithium Projects are strategically situated in this prolific Pegmatite Field. Presently, NAM is the largest mineral claim holder in the Winnipeg River Pegmatite Field and is seeking JV partners to further develop the company’s Li division.